A deliciously satirical attack on a money-mad society, Vanity Fair, which first appeared in 1847, is an immensely moral novel, and an immensely witty one. Vanity Fair features two heroines: the faithful, loyal Amelia Sedley, and the beautiful and scheming social climber Becky Sharp. It also engages a huge cast of wonderful supporting characters as the novel spins from Miss Pinkerton's academy for young ladies to affairs of love and war on the Continent to liaisons in the dazzling ballrooms of London. 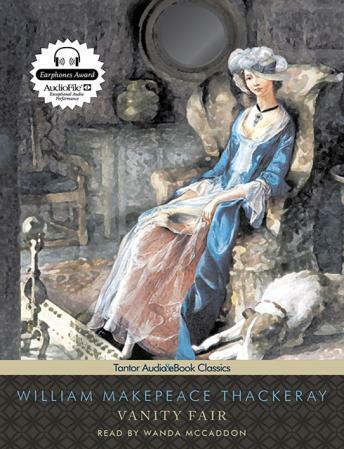 William Makepeace Thackeray's forte is the bon mot, and it is amply exercised in a novel filled with memorably wicked lines. Lengthy and leisurely in pace, the novel follows the adventures of Becky and Amelia as their fortunes rise and fall, creating a tale both picaresque and risque. Thackeray mercilessly skewers his society, especially the upper class, poking fun at their shallow values and pointedly jabbing at their hypocritical 'morals.' His weapons, however, are not fire and brimstone but an unerring eye for the absurd and a genius for observing the foibles of his age. An enduring classic, this great novel is a brilliant study in duplicity and hypocrisy-and a mirror with which to view our own times. The best of Victorian fiction, read with wit and verve. Thackeray was a master of character development and a first-rate satirist, with a sense for farce and delicious understatement. He is engagingly gossipy in tone, pulling the reader into his confidence, but his backdrop is ultimately dark and caustic. In the end, VF describes every manner of con man and woman under the sun, painting both predator and prey with equal reality, insight and cynicism. This listener was astonished to find a passing but vivid depiction of elder abuse in Sir Pitt's nurse.